Today, President Barack Obama’s executive order banning discrimination based on sexual orientation and gender identity by federal contractors goes into effect, marking the single largest expansion of workplace protections for lesbian, gay, bisexual, and transgender, or LGBT, people in our country’s history. The new protections will start by applying to federal contractors with new, renewed, or modified contracts executed on this date—April 8, 2015—and will eventually affect all federal contractors over the coming years. Twenty-eight million individuals—roughly 1 in 5 workers nationwide—will eventually gain basic workplace protections based on their actual or perceived sexual orientation and gender identity. Individuals who are covered and believe they have experienced discrimination of any kind—including based on their sexual orientation or gender identity—can now file complaints with the Department of Labor. Sarah McBride is a Research Associate for LGBT Progress at the Center for American Progress. 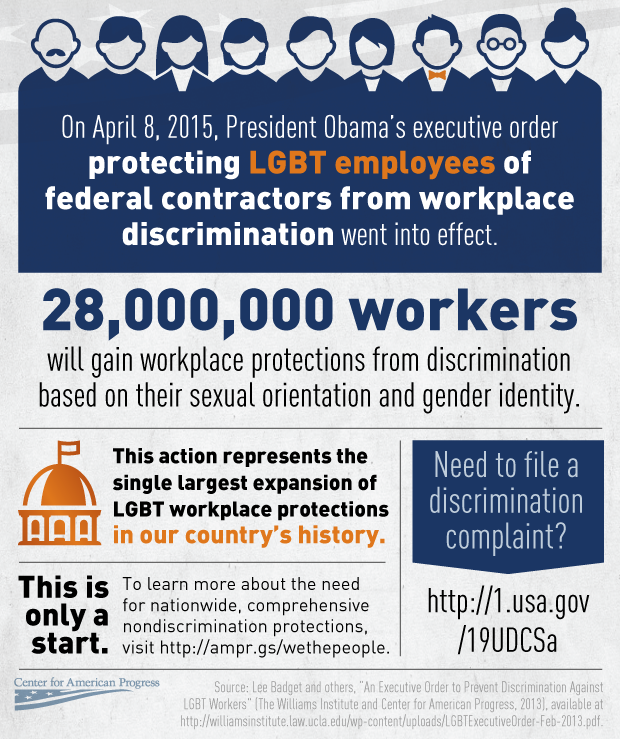 Update, April 8, 2015: This infographic has been updated to clarify that workplace protections will be phased in over time.